The Waikoloa Dry Forest Initiative will be hosting the 7th annual Wiliwili Festival Saturday, February 10th from 9am-3pm at the Waikoloa Stables. 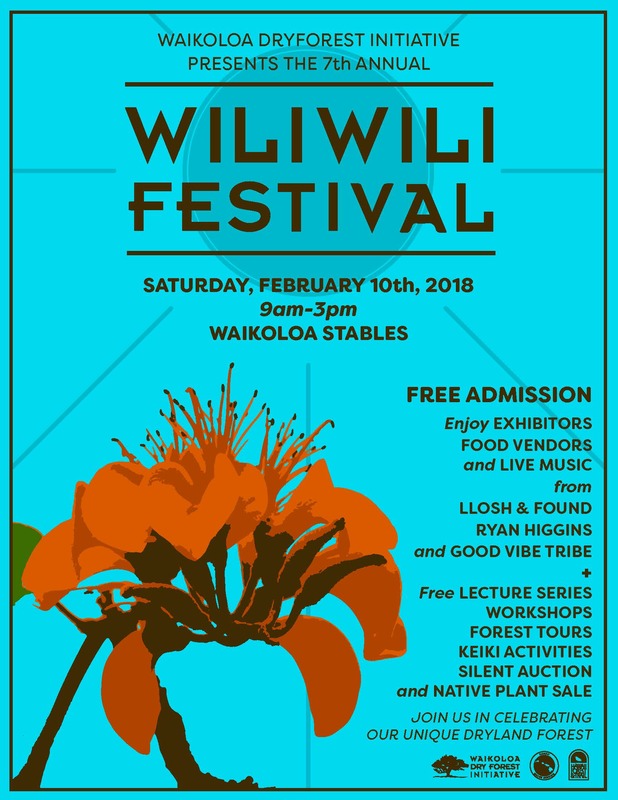 The Wiliwili Festival is a fun, free educational event for all ages and a great opportunity to learn more about the unique environment of our island. This year we’ll be offering many opportunities to visit the Waikoloa Dry Forest Preserve either on a guided hike or on-site workshop. The Wiliwili Festival brings many local organizations and businesses together to raise awareness about our Hawaiian culture and the island’s native ecosystems and the work that is being done to protect and conserve our island’s resources. There will be free interactive demonstrations and hands-on activities for all ages, informational booths sponsored by non-profit and public agencies, a silent auction, free workshops and a great lecture series featuring talks on urgent invasive species issues, stories of place in South Kohala and updates from partners in conservation from across the island. We’ll also have live music, hula performances, native plants for sale and great food provided by local vendors. Guided tours of the Waikoloa Dry Forest Preserve will be offered throughout the day at the Wiliwili Festival. Tour participants will have the opportunity to see the beautiful plant species that comprise the dryland forest and learn more about the Waikoloa Dry Forest Initiative’s forest restoration and community education programs. Tours will be offered every hour, on the hour, between 8am and 2pm. Participants may sign up at the event or in advance for the remaining time slots. Those interested in the early morning tours at 8am and 9am must sign up by email or phone prior to the event. Those planning to attend should wear good shoes or hiking boots and plan for a one hour roundtrip. Transportation from the Waikoloa Stables to the preserve will be provided. Tours are offered free of charge as part of the festival, but donations are encouraged and benefit the Waikoloa Dry Forest Initiative, a 501 (c)(3) non-profit. For more information on the event or to sign up for a tour please contact us at wdfi@waikoloadryforest.org or (808) 494-2208. See our flyer below!